How can you use data more effectively as a tool for improving your team? Here is one example of how a college team uses data. In this previous post I shared some offensive and defensive numbers for the 2017 Midwestern State season. Part of what we shared with the team was the table below. It breaks our offensive performance down by set location/type and pass quality. The other surprising thing was the effectiveness of our in-system outside sets, especially compared to our middle attacks. You expect middles to generally go for a higher Kill % than pin hitters. That was clearly not the case for us. Even worse, our middles had a higher Error % in places. 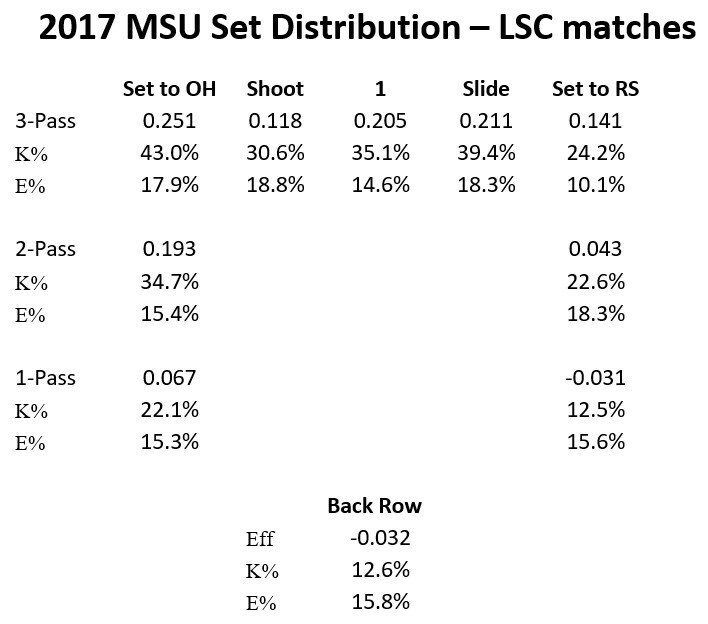 On reason for the high OH effectiveness on the good passes and digs is that we did a good job running the Shoot-Go combination. That gave our OHs some really good, open swings.